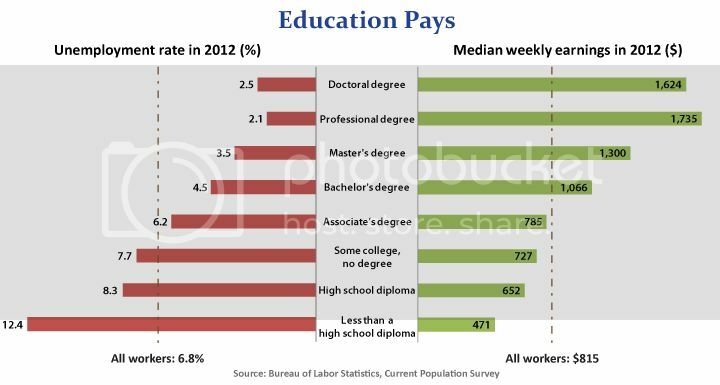 I think college is great, but I think the academics of just became way too commercial and for upward mobility to higher brackets of money vs true academics and the truth worth of learning. I'm more self taught and it's easier for me to understand then someone talking to me and expecting me to do homework and I noticed I keep the majority of the information far better if just debate and learn arguments and counter arguments. Writing papers aren't no big deal for me and it keeps me focus. So when I do make the move I'll have to be there for a year before going back to school, but probably do a trade or something new just for an extra hustle. You didn't read my whole post. I basically said it became more commercial and is not what it once was. You just added words to what I was saying. Of course you don't go to college and be versed in one subject, this is not a trade. What I'm saying that schools definitely in America is far too capitalistic. It's not what it once was, not in the early 1900s, not in the 1800s, definitely not what it once was in Timibiktu. College should not just be as a economic mobility like how people treat it and I do have friends who treat it as such with degrees, but expanding the mind and becoming better as a human being and etc. what planet you living on? Especially when black folk in this country weren't even allowed to have an education! No...not every profession, some professions were for the fruits of research and studying to understand human history, biology and etc. Pure academics. Hence why I said Timbkutu for reference if you're gonna say black people were denied. They weren't denied education there. And mostly it was for pure academics. Universities are pretty ancient. Thanks babe! That's how old I am now. You can do it!! !